Disclaimer: This Entangled Teen Crush book contains multiple PDAs, after-school detentions, and gambling on the side. Warning: betting on a boyfriend is bad for your health. I really liked Zoey, she was fun, sassy, and confident. Also, Zoey and Grant had great chemistry, especially while making all those baked goods in the kitchen! Now, let’s not forget Zoey's Grandma, Monica, who was such a TREAT! Although, I really liked Zoey's best friend, Delia, and I totally thought they made quite the duo, but I did find it a little annoying that it seemed like they did everything together. Nonetheless, I thought it was an enjoyable quick read. It seemed like an appropriately placed YA romance for ages 16+. The Boyfriend Bet is definitely a charming tale and I think most readers (even the older crowd) will enjoy it. I look forward to seeing what Chris Cannon whips up next! 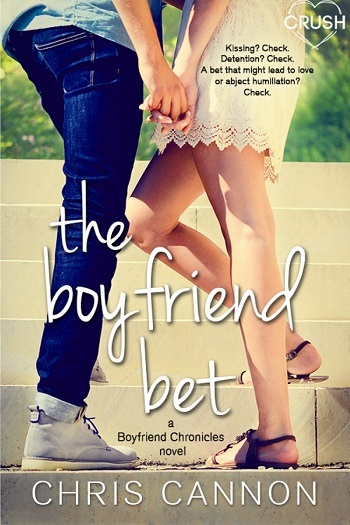 The Boyfriend Bet is the second title in the Boyfriend Chronicles series. Its connection to Blackmail Boyfriend is via Jane – Zoe's cousin. Grant's narration, even to the end, made it difficult to buy that he wanted a relationship with Zoe. I understand not wanting a happily ever after in high school, where you just want to date and be friends. If that's what you want, and the girl you're dating thinks otherwise, cut her loose. If you want more, and the boy won't commit, cut him loose. You are NOT compatible, and neither party is wrong. But if you stay together, it becomes TOXIC, NOT romantic. The constant need to weigh whether or not Grant wanted Zoe by comparing his quirky, spunky, poor girlfriend against his standard of beauty (blonde, rich, long-legged, and shallow) was hard to swallow. No guy who is a player doesn't recognize his counterpart in girls, girls who are disrespecting his girlfriend by hanging all over him. No guy like Grant would allow his ex to yank around him, his family, and his current girlfriend unless he wanted her in his life because it made him feel important to be fought and fawned over. Even at the end, because there weren't enough pages to show an evolution, I didn't feel secure in their relationship. Why the entire star drop from one book to the next for me? While I thoroughly enjoyed The Boyfriend Bet, and read it ravenously page after page, the author utilized plot points from the first in the series. Rich, hot boy dating the poor, farm girl. Guy's family doesn't approve. Guy isn't sure if the girl is hot enough for him, and she never knows if they are truly dating – he says bluntly to her face how she isn't enough, earning a visceral reaction in the reader. The narrator's BFFs dating each other too (but what was sweet in book one, was awkward and uncomfortable in book two, and it wasn't because he was an introvert). Then there is the brother – the brother who doesn't want them to date. Don't get me wrong, all of that works, and those utilized plot points were written in a vastly different way to form an engaging story, but reading the books back-to-back highlighted the fact. But where it didn't work, I truly believed Bryce wanted Haley in book one, but I didn't believe that Grant wanted Zoe during book two. While book three may have the same points (fingers crossed it's Zoe's brother's book), it will be a while between reading this installment and the next, so it won't be as obvious. Anyone reading these books back-to-back will be hit with the wash-rinse-repeat formula. But, Erica... ?!? It's romantic and Zoe did stand up for herself. Um... sorry, bub, but trust is earned, and I'm not sure at what point any has been earned. But Zoe caved, felt bad and apologized for being repeatedly attacked by Grant's ex-girlfriend. So the ex's lies are Grant's responsibility, not Zoe's, as he is the common denominator. THEN Zoe has to prove she trusts Grant, when he never earned it. So that felt like abuser and the victim behavior to me, and this is coming from a survivor of domestic violence, and I didn't appreciate this toxicity infecting a young adult novel that young girls and boys would read and think it romantic or acceptable behavior. While I liked the story, enjoyed aspects of all the characters, the constant level of disrespect was too much for me to handle. The family members, and bizarre side romance of the BFFs (bizarre, as I'm an introvert (INTJ) and I didn't understand the friend's personality) lightened the mood. The comedy gold was the grandparents dating. The PDA and detentions got old. Fast. Yet it happened over and over again. Anyone who hasn't dealt with abuse will probably miss the toxic connotations to Zoe and Grant's relationship – from both sides (his hot/cold and her raging jealousy, which was supposed to be 'cute'). I'm not saying they won't grow out of it, and there was a slight evolution as the book came to a close, which made me happy. If I had a daughter or son, I would want to discuss the book, as I wouldn't want her/him modeling herself/himself after any of the characters – boys like Grant grow up to cheat and be abusive, at the very least selfish and blind, because girls like Zoe continue to love them when they are disrespectful and purposefully hurtful. The girl can't be perfect enough for them, can't do enough, change enough, as the problem is inside the guy – he'll need constant validation from girls/women wanting him, and that doesn't change overnight because of LOVE. (romance novel or not) Not getting what they want is the only way they will learn the lesson – they have to lose you, but not as a trick or trap. Actually lose you – forever – so the next girl like you isn't destroyed, but maybe treated with respect instead after the jerk emotionally matures. Even at the end, Grant didn't deserve a girlfriend – not yet. He needed to grow up first – his mentality has to change, and that doesn't happen through love but experience. Another thing I would discuss with young adults is the ex-girlfriend. If a guy doesn't want you, traps/tricks/manipulations/breaking him up with his girlfriend/stealing him from his girlfriend is desperate and learned behavior that is unacceptable. The ex and all the other girls who knew Grant was taken, they weren't disrespecting Zoe, they were disrespecting themselves AND Grant. I wouldn't want a guy who was so easily led astray. Weak. He'd look weak, and he'd deserve the misery with the desperate woman, and they'd be miserable with their stunted emotions. You can't 'steal' a guy – a guy can't be 'stolen' from you – they leave. Even if she managed to get Grant back, you can't keep someone who doesn't want to be there. So I don't understand this type of woman, even though I know many exist. Same with Zoe – if she feared Grant looking at other girls, constantly grazing the field, then the relationship isn't strong enough to last. My commentary aside, I do recommend this author, this series, and this book, as I feel most readers will fall into the story and find it humorous, fluffy & light, and addictively angsty. But anyone who has suffered abuse will spot the signs, which I believe was unintentional by the author. For reviews & more info, check out our Blackmail Boyfriend post. Award winning author Chris Cannon lives in Southern Illinois with her husband and her three dogs, Pete the shih tzu who sleeps on her desk while she writes, Molly the ever-shedding yellow lab, and Tyson the sandwich-stealing German Shepherd Beagle. She believes coffee is the Elixir of Life. Most evenings after work, you can find her sucking down caffeine and writing fire-breathing paranormal adventures or romantic comedies. Reviewers on the Wicked Reads Review Team were provided a free copy of The Boyfriend Bet (Boyfriend Chronicles #2) by Chris Cannon to read and review.